In Pamplona, Spain the yearly tradition is to throw yourself into an arena and run for your life as an onslaught of bulls chases you. In America, we have a similar tradition, but the bulls are replaced with human sheeple who will stop at nothing to ensure they walk away with the best consumer deals they can find. People are often hurt in both events and sometimes the annual runnings even lead to death as the weaker sheep are trampled during all the commotion. This year the Boston Globe estimates that about 100 million Americans will head out for their annual running and they’ll spend upwards of $13 billion in a single day. The action this year started on Thanksgiving Day and sheep across the nation looking for mega-discounts on cheaply built toasters, electronics and other consumables didn’t hesitate to jump into the ring. 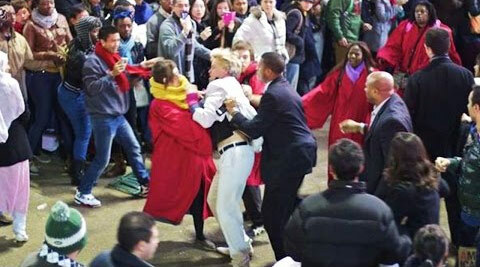 A straight-up mall brawl… with flying trashcans included! Scotland… William Wallace would be so proud… Freeeeeedom! The man in the Chicago Bears jersey is committed…The lady in the green jacket really wants that speaker. A war over flash memory cards…. really? Really!?! Is that flat screen worth a taser to the chest? It wasn’t always a shopping day. In fact, the 1869 Black Friday was a bit different than today. There was mass panic and brawling to be sure, but not because people wanted to save money on the latest in telegraph technology. The stock markets had collapsed after a banking conglomerate had manipulated the gold price. When gold crashed so did stocks and millions of dollars in personal wealth along with them. 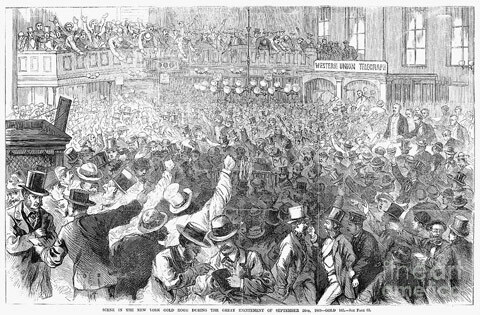 It was reported that angry mobs dragged bankers and tellers into the streets and strung them up in town squares, though no known pictures of said events have survived. Shame on you for mindlessly consuming… you mentally enslaved morons going deeper into debt that you will soon regret… spending money you don’t have on things you don’t need.